Products To Resell For Insane Profit! Why Would You Want to Use Profit Spy? Completely eliminate the painful process of finding high profit products to flip, eliminating days of annoying research. A system designed to pump out quick profit margin turnover and generate cash inside your Paypal account overnight. Simply copy and paste your amazon category url, select your profit margin, and press start. Never worry about paying $1000s in upfront inventory costs. The Amazon marketplace is your dropshiping headquarters. These are REAL screen shots of the results I’ve been be able to achieve using the exact software I’m sharing with you today. I can’t ethically promise you’ll experience the same results, however I can tell you exactly how I achieved these results with the software and let you follow my exact blueprint. If you do, there is no reason you shouldn’t be able to replicate the same success for yourself. That’s all there is to it. Wash, rinse, and repeat. It doesn't get any easier than this folks! It’s so simple your grandmother could do it! I spent well over 9 months losing money with retail arbitrage (dropshipping) when I first got started, to creating a very comfortable, full time living off it, over the last several years. What I’m simply offering you today is a way for you to fast track your success, buying and selling products online, with a piece of software that will quickly target high profit products you can flip online for instant income delivered straight to your Paypal account. You no longer have to worry about overcoming the same obstacles I had to endure through my painful, time consuming journey. I've simplified the process for you and am giving you a chance to utilize one of the most prized tools, I've been keeping secret for a very long time. Take a Look at What Profit Spy Can Do For You! *Disclaimer - results may vary for each particular user. 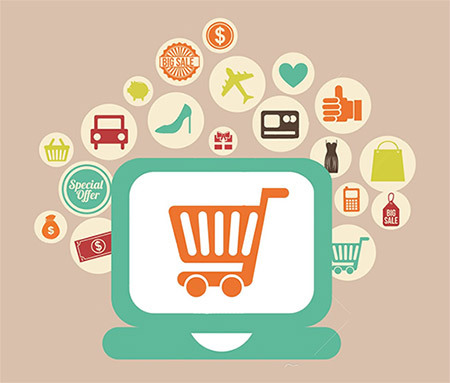 Retail arbitrage (AKA – drop shipping) has been an established business model since the evolution of commerce. Buying low and selling high is a business model that will never go out of style. Unlike so many online gimmicks, the system is not based on some trick, loophole or other unsavory technique that can quickly go out of style as soon as you discover them. Selling goods from one place to another is a money making strategy that is sustainable and can be scaled quickly! It’s an effective cycle that can lead to job replacing income in a surprisingly short amount of time. Profit spy is the ONLY SOLUTION you'll EVER need to conquer this extremely lucrative niche! 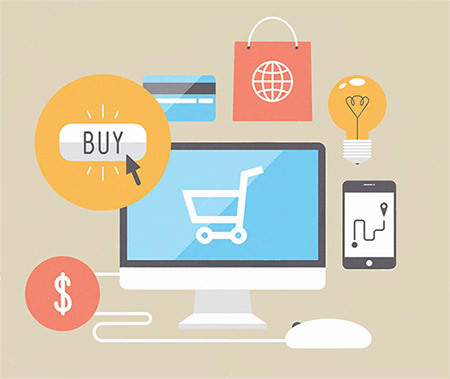 Have fun selling products online without the risk. No inventory costs or upfront payments. I've been arbitraging products on EBay from Amazon for about 3 years. The advantage of the retail arbitrage model (drop shipping) is that you have no inventory to handle and you don’t have to order anything until the item is sold. A very simple and profitable business model. The toughest part of this business has been sourcing profitable items on Amazon to sell on EBay. This is a very tough and time consuming process. The next problem was keeping track of price fluctuations on Amazon. This is no trivial task! Prices fluctuate on Amazon constantly. I knew there had to be a better way. I had heard about Profit Spy through my friend John Hinkle, however being a skeptic is my nature, so I requested review access and some training on how to use it. John agreed and delivered. I was blown away! This software was the answer to my problems. 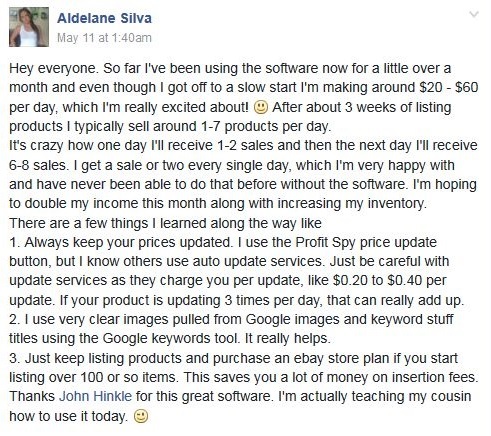 Profit Spy was quickly and easily able to find numerous profitable products from Amazon that I could sell on EBay for a nice profit, including Amazon price updates to ensure my listing prices were up-to-date. 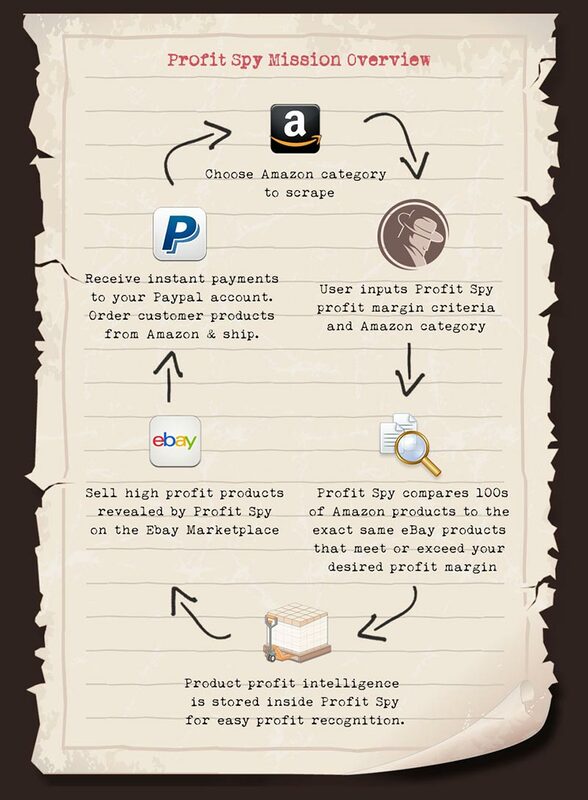 If you are considering Amazon/EBay drop shipping, you need Profit Spy! There is no other way around it. Wow! Purchased this the other day and intend on using this software for my Ebay accounts. I can already see that this is going to save me a massive amount of time. As an experienced ebay seller, I tried out the demo and was very impressed by the speed and information it provides. It's an amazing service that allows ANYONE from ANY experience level to list products on eBay overnight with some pretty nice profit margins too. Their support on both skype and their helpdesk is top notch! 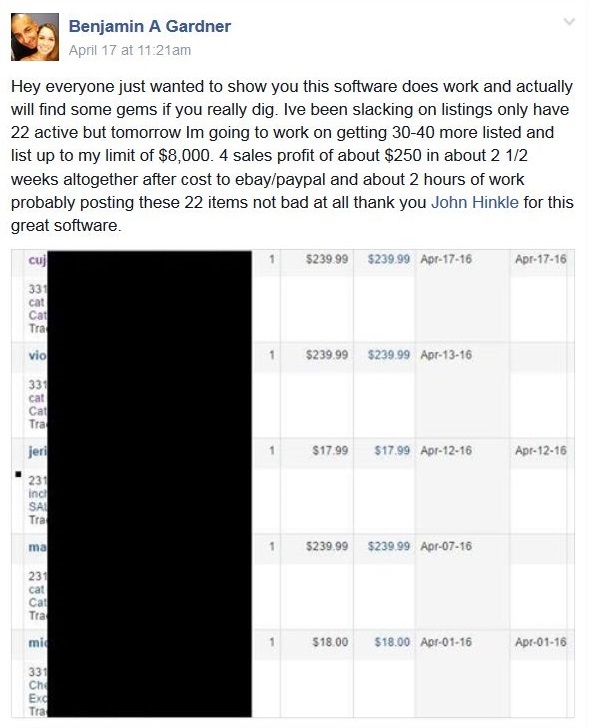 I’ve never experienced anything like what this software provides within all my ecommerce selling days. 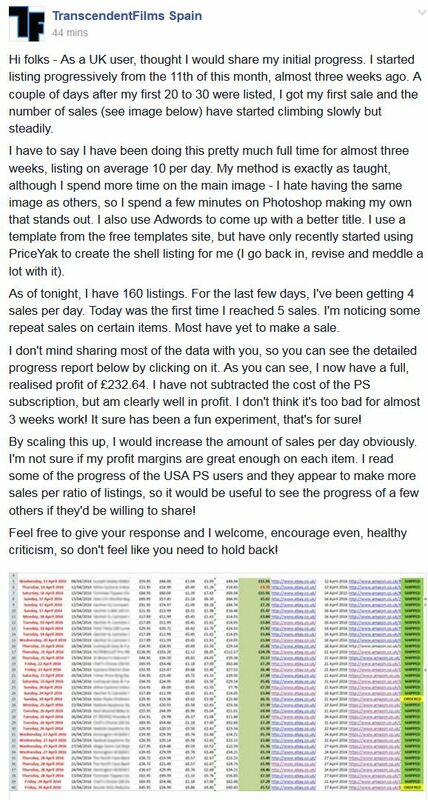 I really wish I had something like this to help me out in those dark, early years of buying and selling online. I’m really glad I decided to purchase the Detective plan a few weeks back. I’ve already made $328 in the last 4 days utilizing the arbitrage products that Profit Spy reveals to me. If you've ever tried to flip products from Amazon to Ebay, you'll quickly realize how time consuming and annoying this process is. Profit Spy practically eliminates this extremely annoying obstacle concerning regarding the product research phase of retail arbitrage, so I can list my items and be done with it! It also has a very cool feature that allows you to update your Ebay listing prices whenever your Amazon dropshipper price increases (which it does all the time). This additional feature in itself has saved me on countless occasions . I highly recommend this service to anyone wanting to make a quick buck dropshipping online. What Exactly Does Profit Spy Do? Save days worth of time locating products to flip from both Amazon US/UK and eBay US/UK marketplaces. Set it and forget it...let Profit Spy do all the hard work of finding high profit products to sell, which will free up time to allow you to do more of what you love, with who you love. Saves days worth of time locating and calculating profitable products! Stay up-to-date with Amazon price fluctuations. Click our amazon updates button to ensure that all your eBay seller listing prices are congruent with your Amazon dropshipper. Prices can be updated individually or all at once. View item purchase history so that you can quickly and accurately view if the item scraped has sold lower or higher than the original price listed. conveniently "color code" the profit margin to reflect if there is was an increase or decrease in price compared to the item purchase history. Locate and export your findings to CSV so you can analyze the data offline or simply use it to post your own eBay listing. Export Amazon ASIN numbers so that you can upload to 3rd party ebay listing software as well as Amazon price auto monitoring services. Say goodbye to annoying fee calculations. All Paypal fees, shipping fees, and Ebay Final Value Fees are calculated and displayed for you within each item listed inside Profit Spy. All profit margins displayed by Profit Spy are net profit (including the fees). Side-by-side product images ensure you have an accurate "apples to apples" comparison on all items within your Profit Spy inventory. Product feedback stats allow you to only list items that have a history of positive feedback and substantial sales record. Last sold data will give you an approximation as to how long your item will take to sell on the eBay marketplace. Amazon Prime notifications will let you quickly view if your drop shipper offers free shipping. Work faster with less clutter. Only keep the products you intend to list within your Profit Spy inventory so you can focus on the items that truly matter. Stay organized with the search function so you only view items that match the search terms provided. 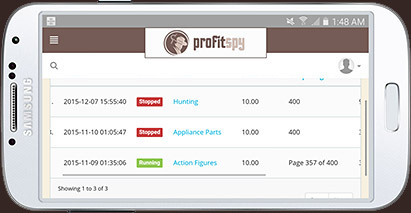 Profit Spy on the go - take it with you anywhere! Fully responsive on all tablet and smart phone devices. Fetch products, compare profit margins, and update your Amazon inventory list prices anywhere and everywhere. What’s it worth to you to have instant access to an inventory of over 850,000+ products you can resell online today, without spending a dime out of pocket? How much would you pay to be able to never worry about ecommerce traffic or having to purchase huge amounts of inventory on faith only to lose more money than you spent? How amazing would it feel to generate a stream of instant income to your Paypal account, on demand, each and every single day? What sort of big pay days do you think you can score with a tool that allows you to do all this and more? I have successfully leased this software for over $175 a month (and will be going back to it after this launch), however for a limited time, I am letting it go for a fraction of that cost, so that you can take advantage of what this revolutionary piece of software has to offer. So for today only (remember, tomorrow is never promised), I am splitting the price up into 3 tiers, depending on what level of experience you are at with retail arbitrage (novice to expert). I've made it easy for anyone to get started with their own dropshipping business today! ...the price will go back up once it's over! Waking up every morning to newly discovered “high profit” products you can instantly unleash on Ebay! After only a few days, you'll obtain a massive inventory you can upload to your eBay store, enabling you to generate passive income on a daily basis. Whether you have a 9-5 job, children to care for, or other commitments, ProfitSpy can deal with any time crunch. No more time constraints, inventory expenses, development costs, or other lame excuses to start making money with your own ecommerce business today! The more products you list from your Profit Spy inventory, the more you make. It’s as simply as that! I was fortunate enough to receive a demo copy of the software and purchased the Secret Spy plan shortly after simply because it was just that good. This thing is like the Cadillac of retail arbitrage research tools. I've been in the niche for a little over a year now (selling used products from classifieds) and this bad boy is going to save me a ton of time finding products to sell from Amazon. I was very skeptical when first starting to use this tool for drop shipping. I had tried other IM software products in the past, that over promised and under delivered, however I was pleasantly surprised to see that this software exceeded all my expectations (and I'm a tough guy to please). After using this software for about 2 weeks now, I've already received a net profit of a little over $325. Not too bad for the 3-4 hours a week I spend doing this part time. Profit Spy really is a necessity if you consider doing any sort of volume within the drop shipping model and making any sort of serious cash from it. Finding products manually, calculating fees, profit margins, and availability on each item you find is very annoying and time consuming at best. I just started using the application over the last few days and it's a true "time saver". It not only rekindled my passion for drop shipping, but has also helped me find a ton of high dollar products to sell within the health and beauty industry that I would have never been adle to find by myself. THANK YOU PROFIT SPY! Exclusive membership to our "Official Profit Spy Facebook Group"
Join our team of retail arbitrage experts and Profit Spy users in this one-of-a-kind mastermind group. We'll be covering drop shipping tips, various ways to get the most out of the Profit Spy software, success stories, arbitrage tips & tactics, webinar training dates/times, and so much more! This in itself is worth the price of subscription! This step-by-step, 15 page "no fluff" guide will take you through the process of opening up Ebay Stealth accounts (additional eBay accounts for product expansion or for those who have been suspended) The guide is also great for overseas sellers who want to sell on eBay US. maintaining a high selling limit eBay Stealth account for many years of glorious arbitrage profit. This is a simple guide that anyone can follow. Make sure you take action and pay close attention to ALL rules and guidelines outlined within this amazingly detailed ebook. Allow Profit Spy to shave days worth of time (not just hours) finding products you can sell online for worthwhile profit and spend more of your time doing what you love to do…..
...creating memories with friends, family , and the ones you love! Will I be able to use Profit Spy if I do not have any experience with buying and selling products online? Absolutely! Most of our current users have been extremely successful with this software without any prior experience. If you know how to sign up for an Ebay and Amazon account, you’re as good as gold! Absolutely! We have the very best support team there is to offer and take pride with serving our clients in a timely manner (usually within 24 hours if not sooner). Our support staff are comprised of competent US, English speaking reps.
Is it against Ebay TOS to sell items from Amazon within the Ebay marketplace? Absolutely not! This is a common misconception by people who have never done product arbitrage before. In fact, Ebay loves sellers who take products from Amazon and resell them on their platform. As long as you keep their customers happy, they're happy. Feedback, shipping, and support will be your most crucial parts of dropshipping on eBay. Can I use this software if I do not live in the US? Will this work for eBay and Amazon UK? Of course! We just introduced the new eBay and Amazon marketplaces to the software a few weeks prior to the launch. Note: We’ll be adding more dropshippers to the software at a future date. Will you teach me how to flip products online? Our members area has a ton of Profit Spy training videos, however this software does not cover the educational aspect of flipping products, which is relatively simple. If you are interested in that, we also offer a “Master Class” course inside our members area, which is a highly detailed blueprint into how I have run my retail arbitrage business over the last few years. Will I receive future updates for Profit Spy, and will I be notified via email? Absolutely! We've already added a few updates to the software within the last few months. Current subscribers were immediately notified of these updates via email and had their accounts upgraded for free. This is a HUGE incentive for subscribing to a plan today, as we'll be implementing even more features and ecommerce marketplaces in the near future. P.S. - Profit Spy truly is the only retail arbitrage software that covers all aspects of the product research phase when seeking valid, high profit dropshipping goods. If you're absolutely new to this topic, we go over some bonus material inside the members area. You'll be able to take advantage of the Arbitrage Master Class once you're inside, if you need the additional help. You have absolutely no excuse to fail with this powerful 1-2 combo. I've given you the "keys to the kingdom", now get out there and conquer it!